Ten million people or more are in dire need of food and other assistance because aid workers cannot reach them, the UN's humanitarian chief has warned. Undersecretary General Jan Egeland said operations in 20 countries were either being sabotaged on the ground or undermined by a lack of funds. He said the crisis in Sudan's Darfur region was currently the world's worst. "I think it's not genocide yet and we can prevent it from becoming one," he told the UN Security Council. He called on the UN's most powerful committee to introduce a new UN resolution meant to protect civilians in armed conflict and prevent smaller crises "from developing into full-blown catastrophes". UN agencies and other non-governmental organisations are facing serious difficulties in providing "the basic means for survival" to the most needy in conflicts not just in Sudan, but in Colombia, Somalia and Afghanistan, he said. "It's a combination of governments not enabling access, armed groups not giving us the security, and even lack of funding not making it possible for us to reach these groups," he said. A major issue was a lack of security for aid workers, he said. He had harsh criticism for the Sudanese government over Darfur, where two million people are in desperate need because of a conflict between rebels and Arab militias. Humanitarian workers had still not been issued visas, and food and equipment was being held up, Mr Egeland said. "The government which should do its utmost to help us is still not helping - some ministers are helping us, but some of their subordinates are sabotaging us," he said. 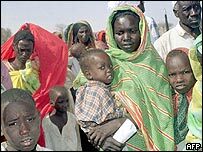 But the people of Darfur are not alone in their desperation, he said. He said restrictions were preventing humanitarian workers from helping 2.2 million people in the Central African Republic, 3.5 million Palestinians, 3 million people in eastern DR Congo, plus millions in northern Uganda, Ivory Coast, Chechnya and the northern Caucuses, Afghanistan and Liberia. The 10th anniversary of the Rwanda genocide gave a "chilling impetus" to act in these situations, he said.